Every month Turkish Airlines offers up a 25% discount on their Miles&Smiles award tickets to select destinations in their network. Well November includes Toronto! 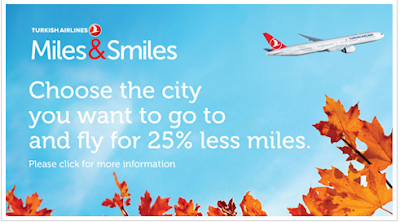 So if you are a Canadian Miles&Smiles member now is your chance to visit Istanbul (or elsewhere in Turkey) for 25% less miles. Normally you are looking at 50,000 Miles for economy class redemptions, 60,000 for comfort or 70,000 for business class. With this promo those lower to 37,500, 45,000 and 52,500 respectively. The 25% discount also applies to using miles for upgrades (normally 22,500 miles now 16,875) and companion ticket options. One item to note is that award flight high season ends on November 4th so if you are looking to redeem for flights between Nov 1 and 4 this mileage rates will be higher. Promotion will include the award tickets which are issued as of 23 October 2013. All rebooking and reroutings can be applied within the same route, class and season until 30 november 2013 no changes is permitted for travels after 30 november 2013 . Mileage refund can be done within 1 year after the ticket issuance date. Any mileage refunds, rebookings and re-routings are subject to penalty.